« Whose Money are we losing? 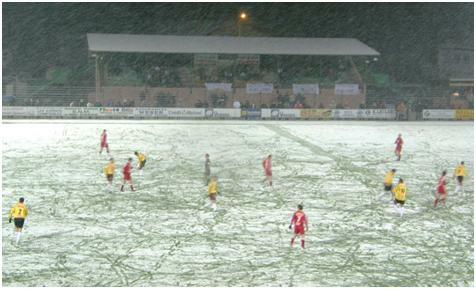 Imagine, coming half way around the World to play football  and yet the game when play is on a cold, wet night and watched by just 700 people. I know some people who take pride in seeing their team play home and away, but the Outre Mer (overseas) teams in the French Cup are a test for anyone. For the supporters of A.S. Tefana, their journey from the island of Tahiti involved changes at Los Angeles and Paris, before winding up at Strasbourg airport in the Alsace  about 30 km from their final destination of Colmar. The home club, Sport Reunis Colmar play in CFA, France’s amateur and regionalised fourth division, where crowds of around 100 are the norm. Like many clubs at this level in France, they play on a municipal stadium, which provides them with the facilities of one good stand, whereas a simple path runs around the rest of the pitch. Colmar is better for football than many of these, insofar as it at least does not have to share the facility with a running track. The French have long integrated the few remains of empire in ways that would shock and unnerve the British. Some of their remaining overseas territories are actually part of the European Union (which therefore includes Reunion, in the Indian ocean, and French Guiana  which is part of the South American mainland). To the best of my knowledge, the participation of these teams in the main French cup started in the 1961-2 season, when CS Moulien, from Guadeloupe visited Dieppe, and were beaten 3-2. For the next two seasons, Guadeloupe were missing, but teams from Martinique entered, while in 1964, both Guadeloupe and Reunion had a team through. A couple of years were missing, but basically Outre Mer clubs have had an increasing presence in the Coupe de France ever since. 1974 marked a breakthrough when Golden Star of Martinique, with home advantage, defeated mainlanders US Melun (in a replay, both games in Martinique), and then travelled to France and lost 8-0 to Nice. It was the first Outre Mer victory, and the first time an Outre Mer club got to compete against a top division side. 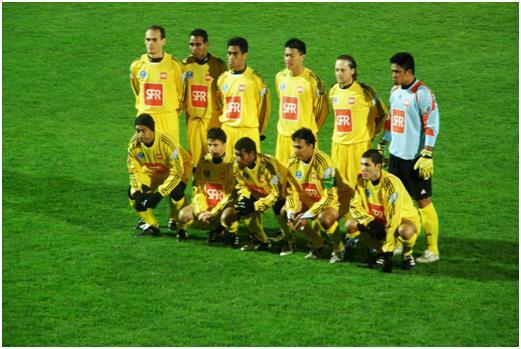 The following season, CA Saint-Dennis scored a 2-1 win over Libourne in Reunion, losing to Guingamp in the next round. To date, 35 mainland teams have lost to the Outre Mer rivals, with Martinique (11) and Reunion (10) leading the way. Last season, records were broken when no less than three clubs from the Outre Mer won through. These were CS Moulien (Guadeloupe) who beat Pacy-sur-Eure on a penalty shoot-out, Samaritaine (Martinique) who won at Les Sables D’Olonne, and CSCC (Guiana) whose also won on penalties, on the island of Corsica, where they beat Bastia CA (an amateur team, not the professional club from the same town). All three went out in the next round. The draw guarantees that any Outre Mer team that plays in two rounds, will have one match in mainland France, and one on their own territory. The choice of mainland clubs is limited in these first two rounds, as the mainland clubs can choose not to be included in the international section of the draw, (not surprisingly, with the possibility of trips to the Caribbean or Tahiti in the draw, there has always been a reasonable take up). After these two rounds are completed, the first division teams enter the cup, and I believe the draw is then open. Only two of the Outre Mer teams have won two ties in a season. The first being Gelder Kourou of Guiana who ended up losing a two legged match to Nantes, by 11-0 (aggregate), while in 1994-5, St-Louisienne (of Reunion) won through to entertain first division Cannes, before going down 2-0. 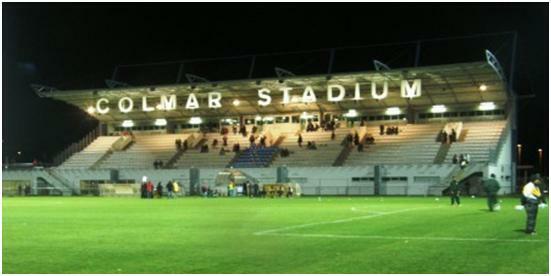 And so to Colmar, where 700 people were at the Colmar Stadium, (the English spelling is used here!). They were comfortably fitted into the single concrete stand, which probably holds around a thousand. Colmar, who had won promotion last season, entered the match as third in their CFA Group, with seven wins and three draws from 12 games, but only 11 goals scored. Their defence (8 conceded) is best in the division. AS Tefana came as leaders of the Polynesian League, with 8 wins out of 8. Tefana come from the town of Faaa, not far from the capital of Tahiti island. The name is reference to the stylised bow and arrow on their badge. Apparently on Tahiti, archery is a sacred sport, limited to the higher born, and only used for ceremonial reasons, never in warfare. 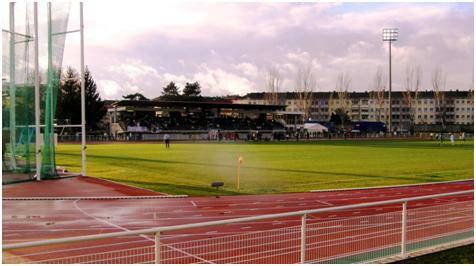 As with the grounds of most teams of this (and lower) levels of French football, the stadium is owned by the municipality, and shows very little sign connecting it to the football club in question. There is no club room or VIP accommodation, and the sale of food and souvenirs are from tables that the club have brought with them to the ground. The souvenirs are scarves commemorating Colmar’s last good run in the Coupe de France, three seasons ago. On that occasion, Colmar (who were then a level below their current status) won through into the last 64 (when the first division teams enter), only to draw St. Louis Neuweg (still a division below them); after winning that, they achieved a magnificent 1-0 win over AS Monaco, before losing out to another first division side, Rennes. Also available (free) was an A4 single sheet programme, printed on one side only and without any player details for the away team. I saw one for a previous game, so this is apparently a regular issue. It was a cold night, but at least the intermittent drizzle did not turn to snow until later into the night. The game started quite openly, with the away side creating a couple of good chances, but as the match continued, so the home side gained control. Despite this, their keeper had few saves to make, instead the home forwards, and especially Pape Dieye, kept hitting the ball wide or over. Almost inevitably, the game went into extra time, and it was then that Pape Dieye finally found his mark, to give Colmar the lead. Colmar continued to attack and be wasteful, although they at least tested Samin in the Tefana goal. A useful warm up for the goal keeper, as with four minutes to play, substitute Petillon levelled the scores. Tefana took the first penalty scoring to the keeper’s right (I think they all went in on that side), while Colmar’s first hit the post. When the eighth penalty was reached, Tefana lead 4-2, and as Samin punched away Grossjean’s attempt, the Polynesians were through. There were a good number of Polynesian supporters in the crowd, although most were from the immigrant community already in France. Indeed, in the past, many of the cup matches have been played in or around Paris, where a good ethnic crowd can be found from any of the territories, and travel is easier for teams flying into Paris. This seems to have now been abandoned in favour of home grounds, (I certainly prefer this). I did speak to some Polynesians who had made the journey in support of their team, wrapped up against weather which is never found in Tahiti. Still, they were rather pleased to get a result. For the second match of the weekend, I had less than one hour’s drive to St. Louis Neuweg. This is a busy suburb of a large city  the odd thing being that the suburb is still in France, but its city, Basel is in Switzerland. You head down the main street, and at the end of the border post between the two countries. Turn left just before the border and you are at the Stade de la Frontiere. This is another municipal stadium with a single stand  and in this case there is a running track as well. The home team, having also been promoted last season, are in CFA2, still one division below Colmar, while the visitors, SS St. Jeanne D’Arc are from La Port, Reunion. They only won the right to make the visit a week ago, and this is obviously worth making a song and dance about. To prove this, when I arrived at the stadium I found supporters of the visitors making a song and dance, playing their drums and generally enjoying themselves. Again, the majority of the away support, numbering well over 100, is from the immigrant community living in France. They are not necessarily local, I spoke to a family who had travelled from Toulouse for the game  which is certainly not within a comfortable day’s drive. It was interesting to note that a lot of the visitors had scarves or hats with the away team’s name on, even though none were on sale at the ground. Unfortunately, while the fans were resplendent in club colours of purple and white, the complications of the cup keeps the teams from wearing these colours. For the French cup, clubs must wear shirts bearing the cup sponsors, and not the same ones as per league matches. The sponsors will provide these shirts, but only in a limited range of colours. The visiting supporters kept up a rhythm and drumbeat throughout the game, which made it a bit like an African cup game in miniature. The football, by comparison was no great shakes  both sides limiting themselves to a single forward and little in the way of excitement in the first half. St. Louis changed their single striker at half time, and in the early part of the second half, it really looked as if they could take the game, but the balance moved back when Jeanne d’Arc followed suit and changed their striker, (incidentally, the only white player in their starting XI). It was a second substitution, coming on in midfield who had the greatest effect, scoring with just seven minutes to play. For the evening, I left the Alsace for neighbouring Lorraine, heading up into the Vosges hills in increasingly bad weather. About 15 km before I reached my destination, Raon L’Etape, I passed by the slightly bigger town of St. Die  who were to provide the opposition for the evening’s local derby. The home side had spent a number of seasons in the National semi-professional third division, but unfortunately, the opening of an impressive new stand this season sees the team back in the CFA (French Amateur Championship, the regional fourth level, which also includes Colmar). This was on the far side as I looked across the snow covered pitch on arrival, and as it is quite tall, must provide over 2000 seats. On the entrance side, is a small wooden stand, with only a couple of hundred seats, but probably more than sufficient for the clubs current status. 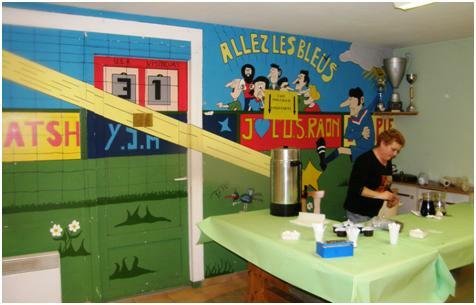 Alongside this was a long clubhouse, which reminded me of Belgium grounds, with a league ladder on one wall, and coupons on sale for food and drinks  as the bar does not take cash. 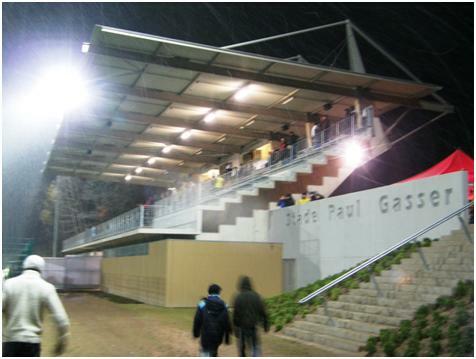 Both stands are well raised above ground level, which helps in viewing, as although there is no track here, there is a wide path all around the pitch. Admission was 8 Euro (for a seat), one could stand for 6, with no elevation, and no protection from the snow. A small programme was given away free  it looks like a regular issue. Once again the effect of the sponsors on the team colours came into play, Raon L’Etape would normally play in blue, while St. Die are red, but for this game, the home team were in Red, and the visitors in yellow. 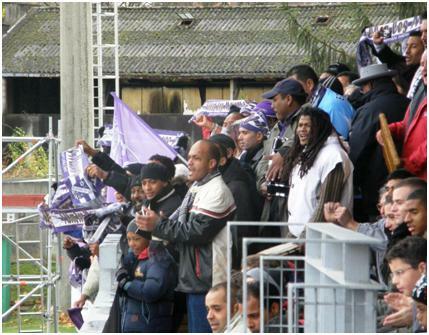 A good crowd was present, around 500  a sign, I would think of a local derby and a cup match. The teams have not met for a while in the league, as even now St. Die is a division below their hosts. We started with a snow covered pitch, and only the lines cleared. Surprisingly, the normal white ball was in use at the start, but this was soon replaced by an orange one. Unfortunately, this ball picked up snow whenever it rolled across the pitch, and slowed down dramatically. Neither team found this conducive to good play, but it soon became clear that the home team were a class above their opponents. It was just that they did not have wherewithal to prove this. Time after time, they seemed to fumble the ball in front of the goal allowing the otherwise floundering defence to catch up. Half time was extended for another bout of snow clearing. Over a dozen stewards cleared the snow, and all the lines were remarked. The snow was cleared completely in both penalty areas, but in a cheeky effort to gain advantage, so were the wings level with the penalty area, for the direction Raon was attacking only. Not surprisingly, the referee was not going to accept this, and a further delay ensued as he demanded equality at the other end. One could argue that this effort was not fully required  as if you looked out to the pitch as half time started, you would see not a single footfall to disturb the snow of the left wing, where St Die were supposed to be attacking. The game got underway again, after a half time exceeding 30 minutes, and with all the snow clearing making little difference. The home side continued to get into good positions, but failing to place a shot. One cross from the left hit the post hard shifting a cloud of snow that had settled on the framework and netting  but it was just a misplaced cross. With ten minutes to go, we finally had a breakthrough, and it was a simple one, the winger moved down the right, and crossed to the unmarked striker about 15 yards out, who simply slotted the ball home. That should not have been the end of the scoring, but it appeared almost that the home side did not want to embarrass their neighbours with a bigger win. Checking the results after the weekend, it turned out that the two victories I had seen were the only ones achieved by the Outre Mer teams during the weekend. As I already mentioned, both were guaranteed to play at home in the next round on 13/14 December. Jeanne D’Arc will play Feignies, while Arras will visit Tahiti. For Feignies, it will be their second successive encounter with the Outre Mer, as they beat Evolucas Lamentin of Guadeloupe in the last round. Both clubs are from Northern France, and play in the same group of CFA2, where Feignies are currently 2nd, and Arras are 4th. This entry was posted on Thursday, November 27th, 2008 at 01:26 pm and is filed under The European Game. You can follow any responses to this entry through the RSS 2.0 feed. Both comments and pings are currently closed.